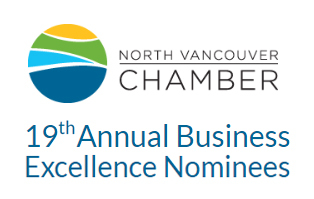 We are honoured to have been selected as a Finalist for the North Vancouver Chamber of Commerce Business Excellence Awards, in the category of Business of the Year. As part of this nomination, a student from the Capilano University Motion Picture Arts Program is paired with each business, and creates a short feature film to be showcased at the awards gala. We are looking forward to seeing the work of these students, and will upload our video on our website after the ceremony so you can take a look. The awards ceremony is on November 3rd, and we wish the best of luck to all the other businesses nominated. Thanks to the North Vancouver Chamber, our clients, and our staff who work tirelessly to make our business great.